Ever since Yamaha took the wraps off its Transcontinental Touring line of motorcycles, the bagger fans here at MO have been chomping at the bit to throw a leg over the 2018 Yamaha Star Eluder. From the ever-popular V-Twin propulsion to the latest in motorcycle electronic technology, the Eluder appears to have just about everything a bagger should. Read on to find out why. Well, not even virtually. The Star Eluder is the Star Venture without a few key components. Front and rear are the shorter windscreen and the trunk. How could the Eluder be a bagger, otherwise? Naturally, the windshield adjustment and the rear speakers with their dual-zone audio controls were eliminated, too. Two items you might miss on the Eluder are the Sure Park assistance for moving the bike backwards (and forward!) and the heated grips (which are still available as an option). 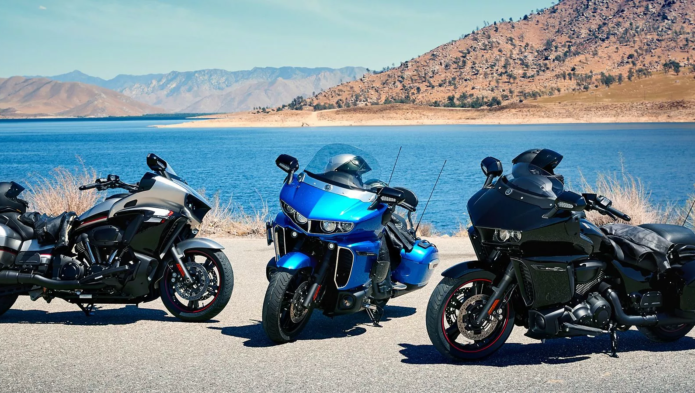 Otherwise the missing ingredients read like an accessory package on a touring rig: mid-fairing wind deflectors, adjustable rider backrest, tire pressure monitoring system, and fog lamps – most of which are available from Yamaha’s accessory catalog for those who want them. Stylistically, the Eluder wears different paint schemes and a blacked out engine, exhaust, and wheels. Although the Eluder’s engine shares its air-cooled, OHV, four valves-per-cylinder, 48° V-Twin design, and 1,854cc displacement with previous Yamaha Big Twins, this 113 cu. in. engine is all new for Yamaha’s 2018 Transcontinental Touring line says Yamaha. Twin counterbalancers combine with composite engine mounts to keep annoying vibrations from reaching the rider without sacrificing the V-Twin character. Our measured torque peak was 105.8 lb-ft at 2,800 rpm, which is right were the engine is turning in sixth gear at 75 mph – perfect for passing. Ride-by-wire throttle means that the engine has both cruise control and ride modes (D-mode in Yama-speak). Dual alternators pump out 750 watts which is more than enough to power the Eluder’s infotainment system and any add-ons a touring rider could want. Finally, the dual exhaust’s note was developed with assistance of engineers at Yamaha’s music division. Even though the Eluder doesn’t have a trunk, you can still carry a bunch of gear. The two weatherproof saddlebags each hold 9 gallons (available accessory liner bags will ease the transition from bike to hotel). On the fairing, three smaller storage compartments (two on the left and one on the right) hold life’s little necessities for quick access on the road. The right storage compartment locks with the bags and contains both an auxiliary audio input and a USB connection which can charge your phone and connect it to the infotainment system. While the Eluder may have lost the standard heated grips in the transition from the Venture, the heated rider and passenger seats will go a long way towards keeping you warm in the rain and/or cold. The seat offers three levels of heat, but what is unusual is that each setting is individually variable. What this means is that in Southern California, where temperatures in the low 50s seem cold, the low, medium, and high settings can be set to lower temperatures, while riders in places where it really gets cold can adjust the three settings to meet their more extreme needs. Everyone hates having to take their gloves off to fish the ignition key out of their pocket while their riding buddies laugh and point fingers. Well, the Eluder’s wireless key fob means that, if you’re sitting in the saddle, all you have to do is turn the ignition switch to start the bike. Now, you’re ready to ride. You can also lock and unlock the saddlebags and the storage compartment on the right side of the fairing with push of a button. On the tank, a set of buttons allows the rider to either lock/unlock the bags or, when the engine is off, open the fuel filler door – all very nice and as upscale as one would expect from a motorcycle in the $23k price range. Worried that your riding buddy might take off on a quick ride with your Eluder when he goes to get some of the gear you carried for him in your saddlebags? Well, send him with the key instead of the fob. Yep, under the rubber push-button lid release is a slot for the standard metal key that is cleverly stored inside the wireless fob. Although the screen is set up for touch access, the well-thought-out button array on the left grip keeps the long reaches to the screen to a minimum. From the grip, cycling through the information screens is as easy as pressing a single button. Changing the music source – with your choice of Pandora, SiriusXM, USB, AUX input, AM/FM radio, and CB radio – only required a couple more presses of buttons and can be done mostly from memory once you’re familiar with the menus. Folks who travel regularly on their Eluder will want to opt for the additional features offered in the Star Eluder GT Option Package. This upgrade to the infotainment system ads several useful capabilities. First, you get a GPS. Yeah, lots of us get by with a smartphone in the pocket or mounted to the handlebar, but an OEM GPS makes travel much easier. Routes can be planned on a home computer and then uploaded to the system via the USB port. A SiriusXM receiver comes with the GT Package, and with a subscription, gives riders a wealth of music and other audio options. Perhaps more importantly, the subscription also enables weather and traffic information while on your route. Also, if you are a fan of CB radio communications, the GT Package brings that functionality to the features list. Finally, a security alarm is included with the GT Package to help keep your Eluder safe when it’s not out on the highway. The standard Eluder’s MSRP is $22,499, and the GT Option Package bumps it to $23,999.